When we talk about CIA, we aren’t referring to spying on you or conducting clandestine activities for national security purposes. In our business, however, this acronym does refer to security, as in the security of what might be your company’s most valuable asset — its data. Ensuring that only authorized individuals have access to data and network resources. Examples include preventing hackers from accessing files or your network to carry out their attacks or keeping employees from seeing data they aren’t supposed to (i.e., their co-workers’ salaries). Ensuring that the data is accurate and protected against corruption, accidental changes, or malicious changes. Ensuring that the data is available, securely, when you and your employees want it, and that network resources are available for work-related tasks (i.e., Internet research, printing). Everything a good IT consultant does will revolve around the CIA principle, from maintaining and monitoring your network to minimize downtime, to guaranteed response times, to backups, policies, and security solutions. 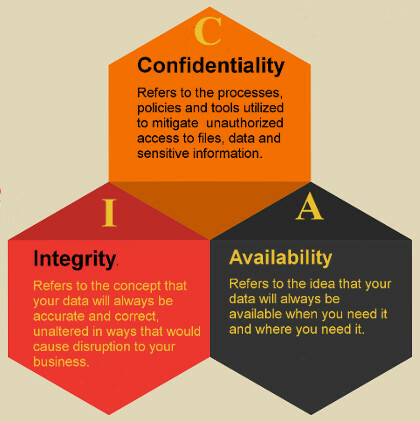 For information on how we can preserve the Confidentiality, Integrity and Availability of your company’s data and network resources, contact me at ericm@flexitechs.com or 302-537-4198.